This outing took place at the stage in life when it became clear I would be outlived by the Peace Bike. Believe it or not, we still needed to cover some poo downtown and just to the northwest. So poo it shall be. Thorpin' it up! 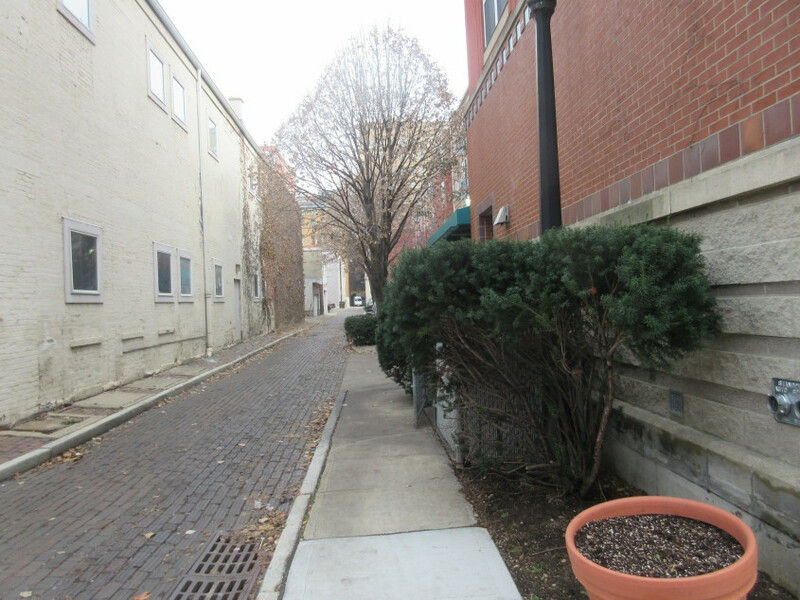 This minor thoroughfare downtown is Thorp Alley. 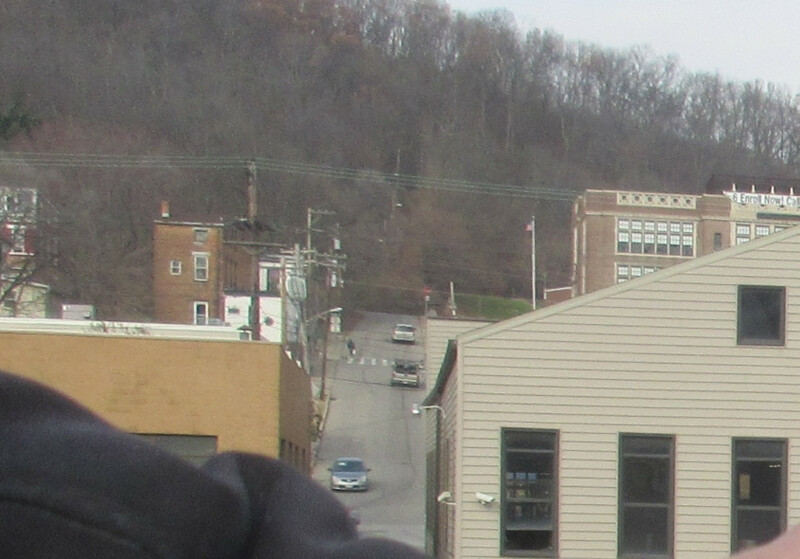 This is looking west from Vine Street. Notice it goes under part of a building. And the alley is public property, despite what the sign says. I looked it up. 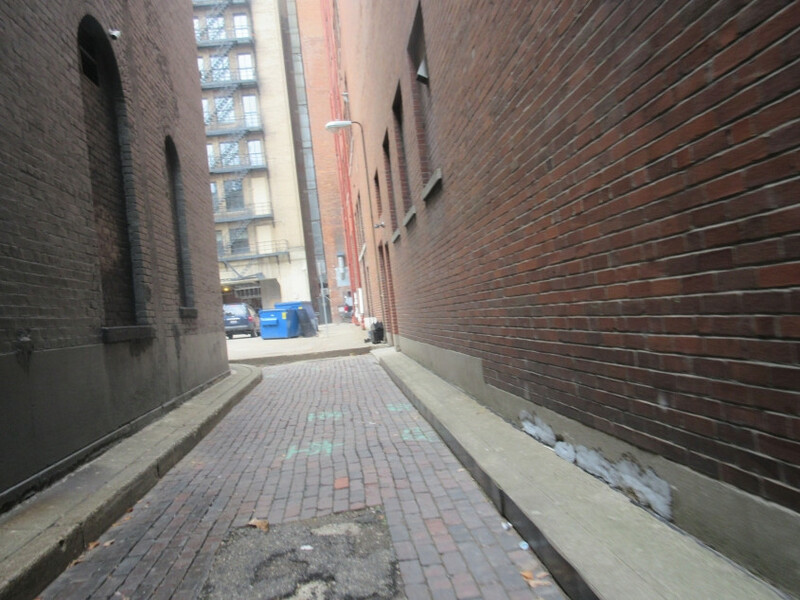 This brick-paved way is Morand Alley, looking east from Race Street. Alleys are roads, aren't they? Roots Alley approaching 7th. The most endearing feature here is the sign for Burger Chef, the long-defunct fast food chain. 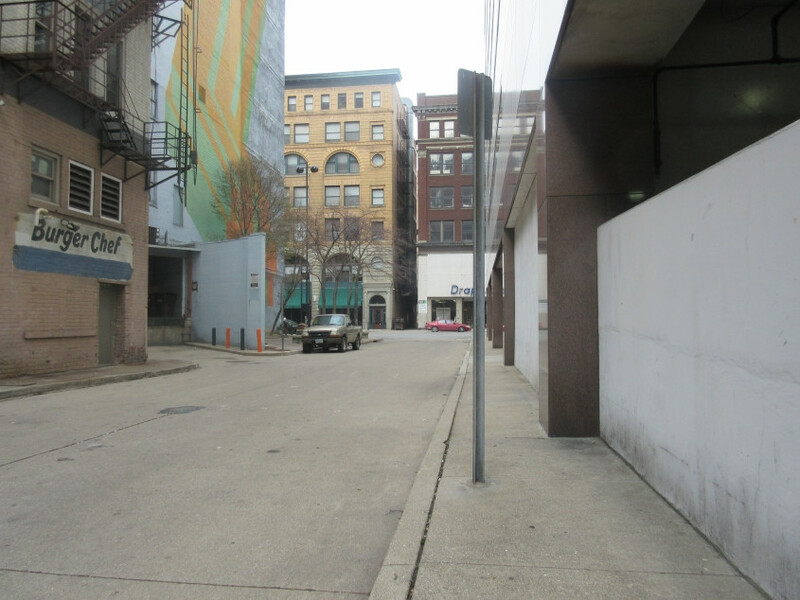 Up ahead is right where the famous Occupy Cincinnati sidewalk chalk bust of 2012 occurred. 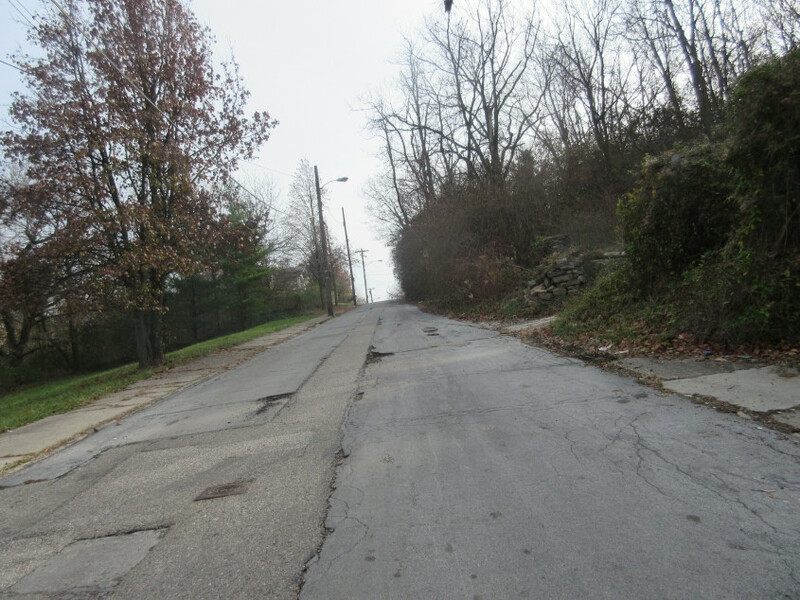 East on Weaver Alley - the former Andrews Alley. 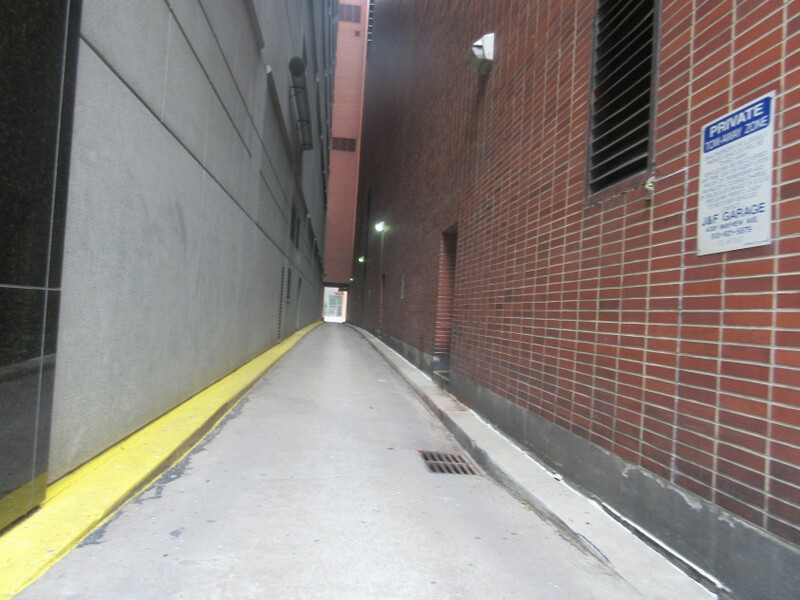 Looking a bit in the distance on Weaver Alley, you see it goes under part of a building like Thorp Alley does. North on Elm at 9th. 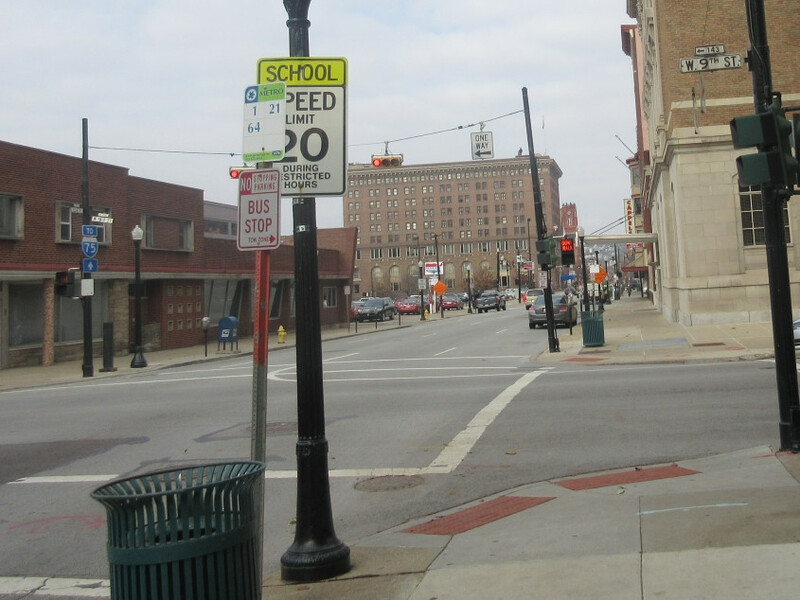 The 1950s-era sign blades like the one for 9th are misappearing fast. West on 9th. You see another one of those old street signs. The I-75 sign below it is no spring chicken either. 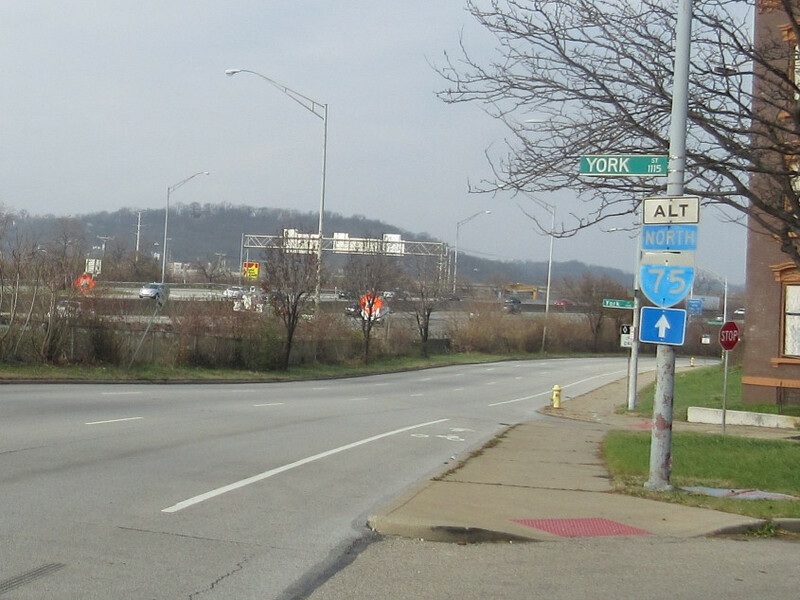 Same is true of this I-75 marker on Ezzard Charles Drive. 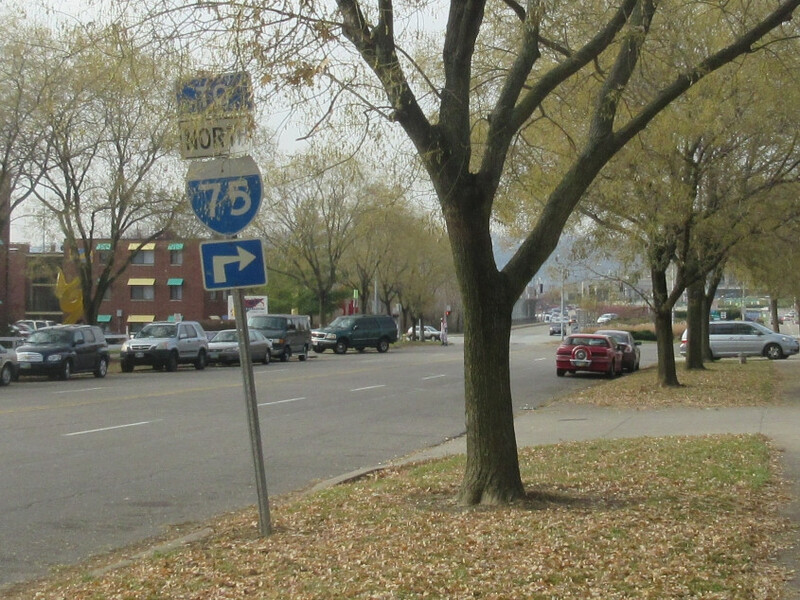 Some old, old route markers on the ever-useful Winchell Avenue. When it rains, it pours, doesn't it? Here's yet another old, fading sign that naysayers would say is ready for the gar-bahge. That's because they're not Roads Scholars. This is on Winchell at the little traffic island to York. I-75 is in the background. 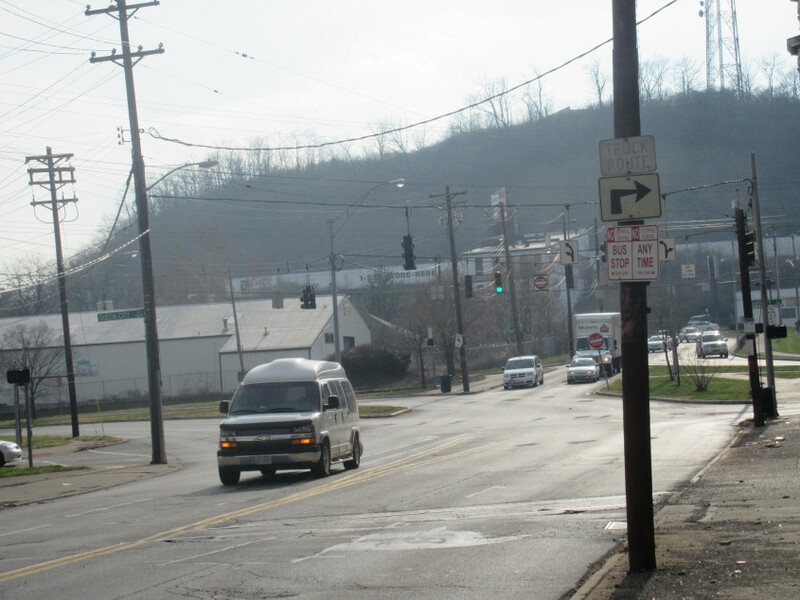 West on Bank Street at Winchell. 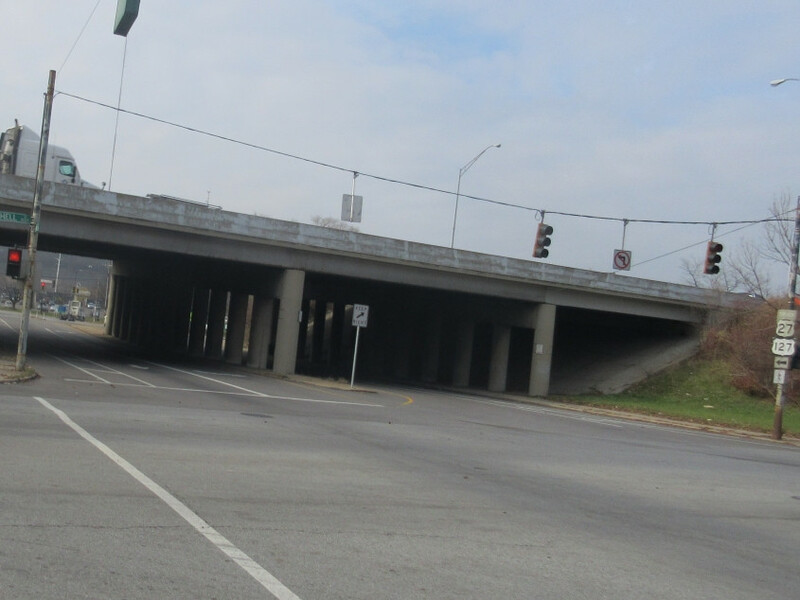 Bank goes under I-75. 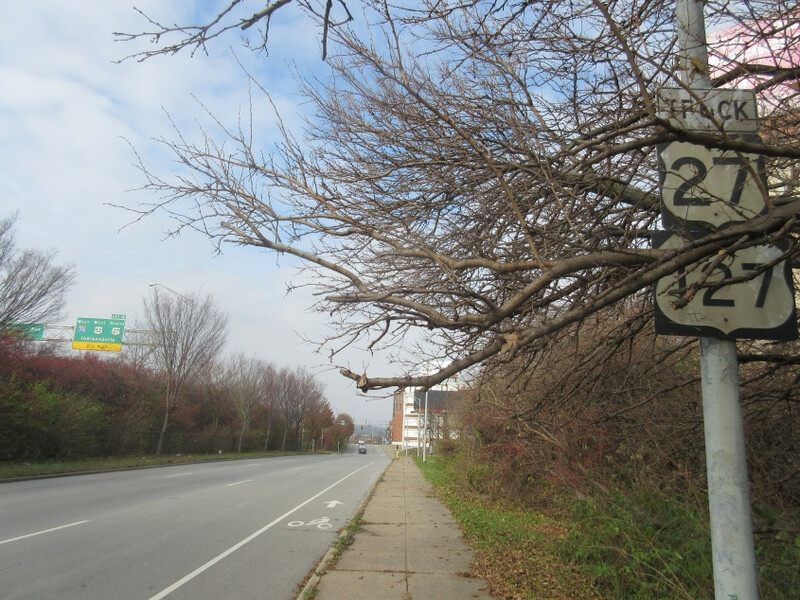 The markers for the US 27/127 truck route are also very old. 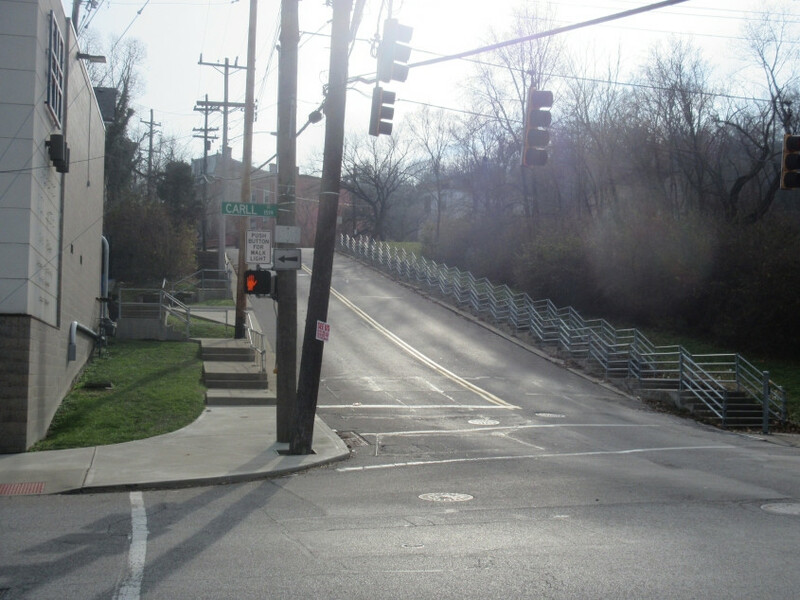 Bank Street at Spring Grove Avenue or Dalton Avenue. There's another feature here that's becoming rare: On the traffic island, you see one of those posts topped by a yellow, bell-shaped cover. Those reportedly date from the old streetcar system that was abolished in the early 1950s. 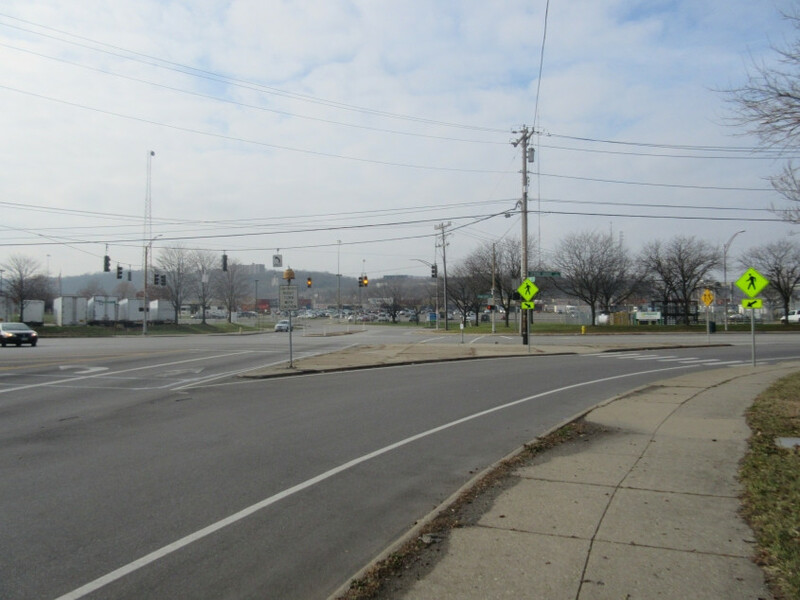 Thus, this post has stood since before the traffic island was created. 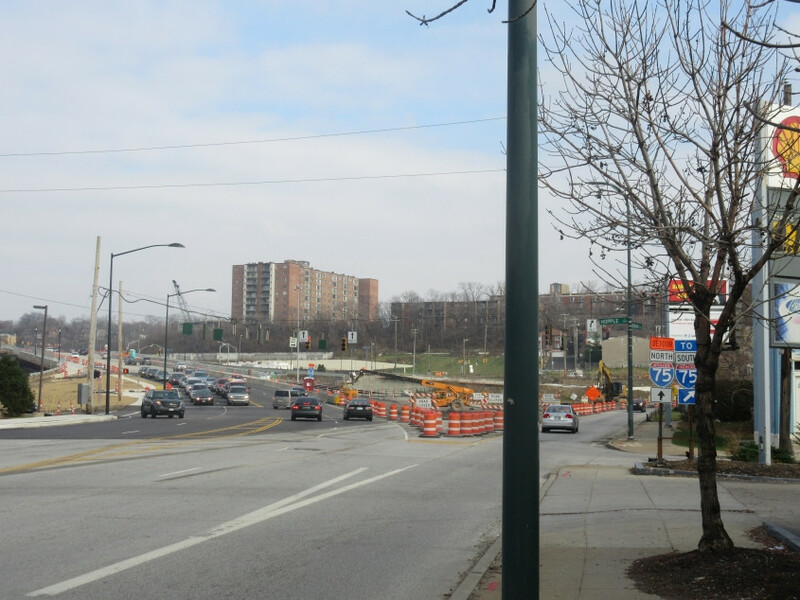 East on Hopple Street on the new bridge being built over I-75 and Central Parkway. South on Beekman Street at Carll Street. It has a staircase for a sidewalk because of its steep nature. As has long been the custom, each mention of Beekman should be accompanied by moving one's hand like a beak and talking in a Big Bird voice. 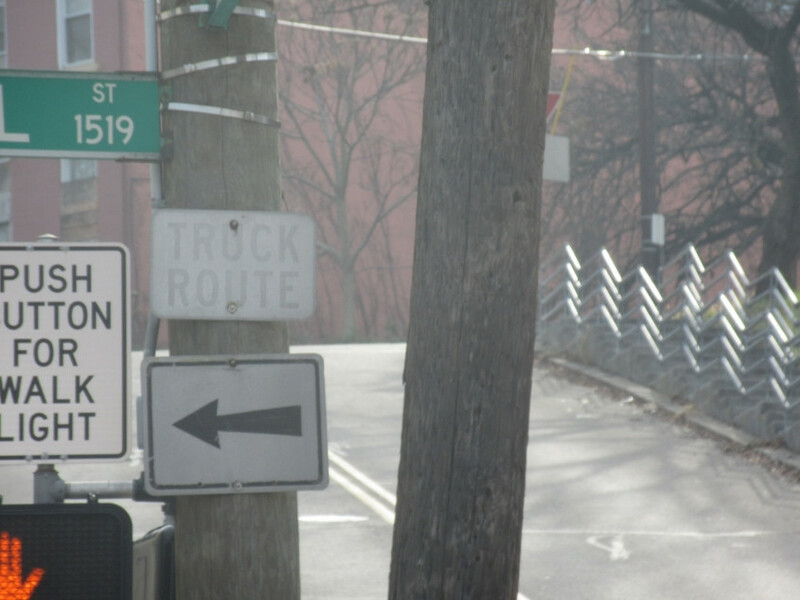 A close-up of the truck route sign at Carll & Beekman. It's old, it's here, it's in your face! 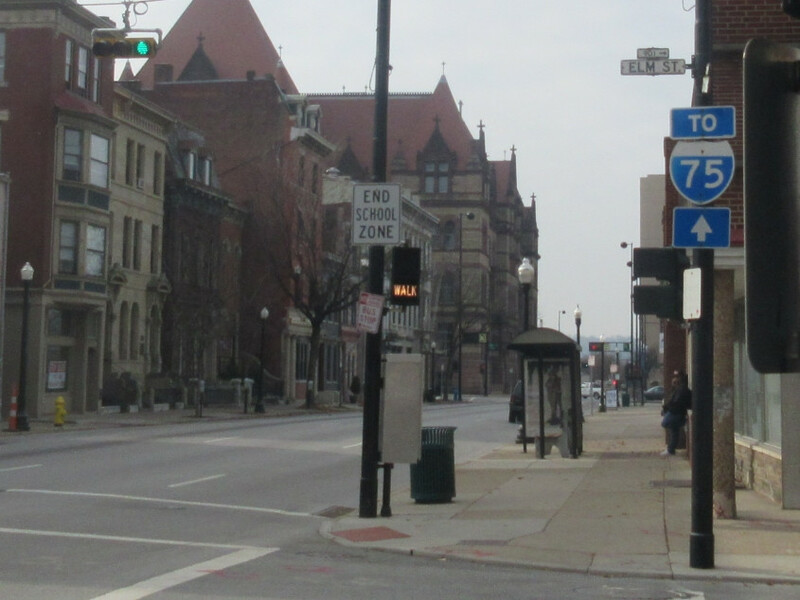 Another indication of a very old sign is Ohio's former use of the tapered arrow that you see here. 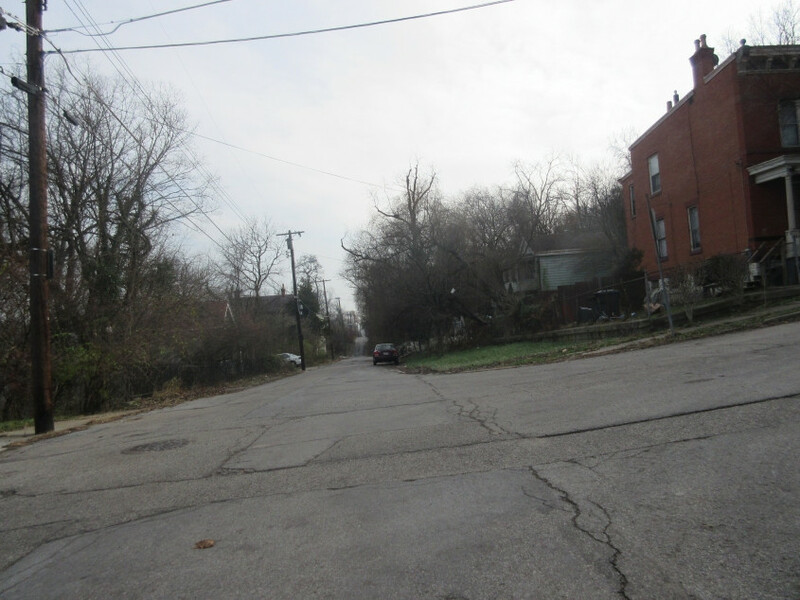 Southeast on Liddell Street - a minor but satisfying road paralleling Beekman. Liddell at Grove Street. I remember how the board game Easy Money had a Grove Road, which everyone called Grover Road. A video of the Peace Bike enjoying Liddell Street! We take Fairmount Street down to Beekman Street. Beekman approaching Queen City Avenue. This is yet another of those old, faded truck route signs with the tapered arrow. 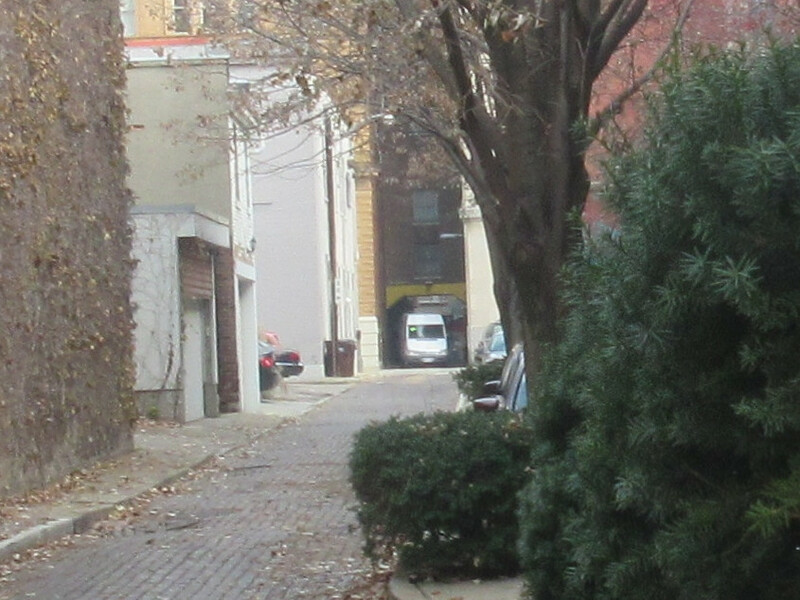 A view of Pinetree Street from Harrison Avenue. It's a road.